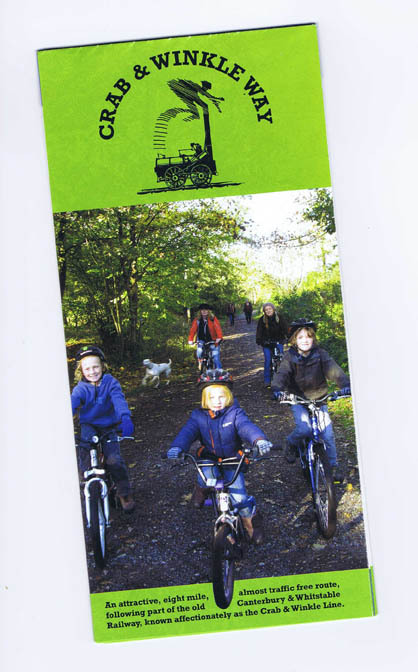 The Partnership has published a range of guides for both walkers and cyclists in the Stour Valley. While most of these are available as free downloads online, others can be purchased directly from us as full colour booklets. These are free to download, or can be ordered from us as paper copies and may be available from either the Canterbury Visitor Information Centre (01227 378100), or Ashford Gateway Plus (01233 330316). A 25 mile waymarked route through one of the largest and most distinctive ancient woodlands in Britain. 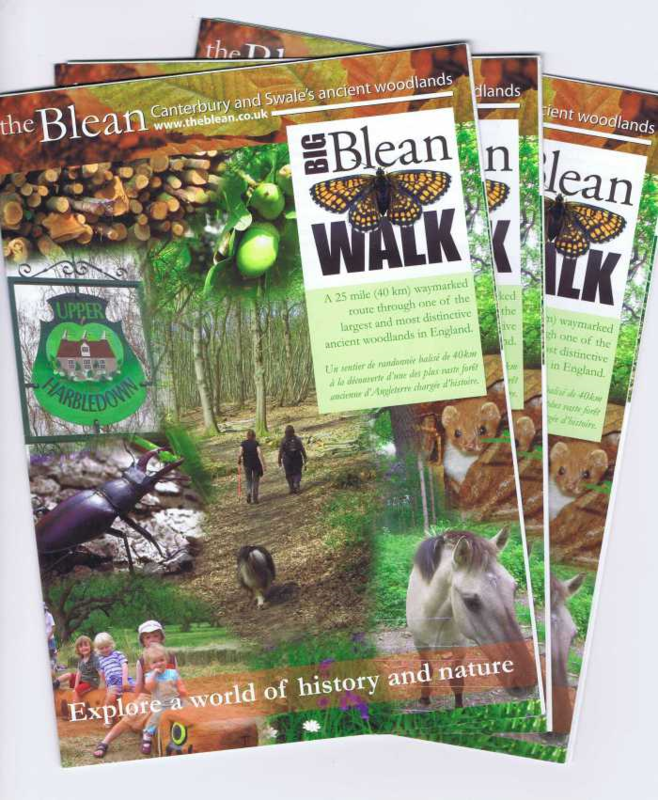 The Big Blean Walk can be done as one very long circular walk or in stages. The recommended starting point is Selling Railway Station but the Walk has been waymarked in both directions. You can make use of the Great Stour Way, North Downs Way or the Crab and Winkle Way to join or leave the Walk. An attractive, eight mile, almost traffic free route, following part of the old Canterbury & Whitstable Railway, known affectionately as the Crab & Winkle Line. The route runs from Canterbury city centre to Whitstable Harbour, passing through the Blean. A number of specially commissioned sculptures can be seen along the route. The Way forms part of National Cycle Route 1. 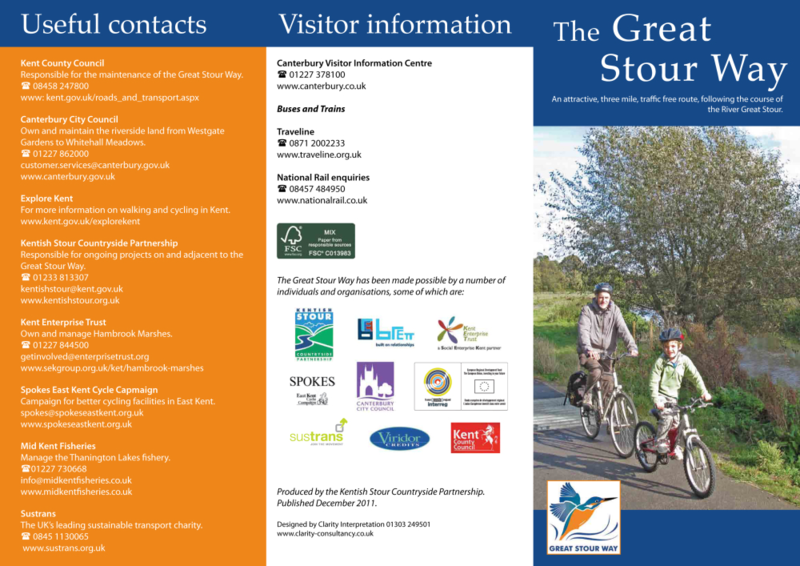 A guide to this 3 mile traffic free multi-user path which follows the course of the River Great Stour. The leaflet has a wealth of background on the wildlife and heritage of the Great Stour, including some lovely species photos. It tells the story of the river, and the development of the path. There is also all the information you will need to make your visit. It features an additonal detailed map with numbered points of interest and showing locations of seats, RADAR gates, toilets and parking. This third edition of the Ashford Green Corridor leaflet gives updated information on this urban river Local Nature Reserve. It is twice the size of the first edition and includes a series of seven walks through the corridor, with hand painted direction maps and information on points of interest. 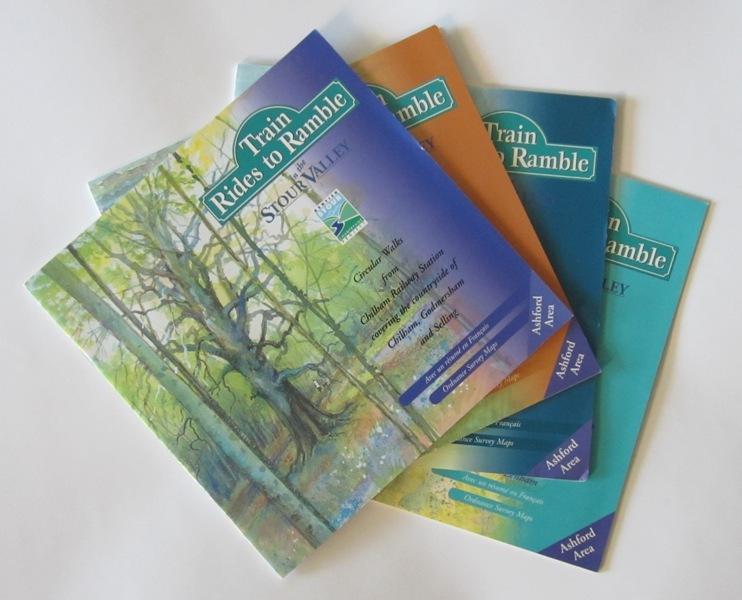 A series of eight attractive, full colour booklets describing circular walk routes in the Stour Valley. Each booklet contains three or four walks, full directions, ordnance survey maps and a wealth of illustrations and information about what to see on the way. Routes range from 1.5 to 12 miles. Walks from Wye, Chilham, Charing and Pluckley railway stations. Areas covered include: Wye and Crundale Downs, King’s Wood, Godmersham Park, Selling, Chilham Lake, Hothfield Common, Westwell, Egerton and Little Chart. Walks from Bekesbourne, Sturry and Chartham railway stations and Grove Ferry Picnic Site. Areas covered include: Stodmarsh National Nature Reserve, Westbere Marshes, Fordwich, Chislet Marshes, Littlebourne, Wickhambreaux, Patrixbourne and Denge Wood. Each booklet contains directions and maps. All the route maps may be downloaded for free as PDFs – click the link below. 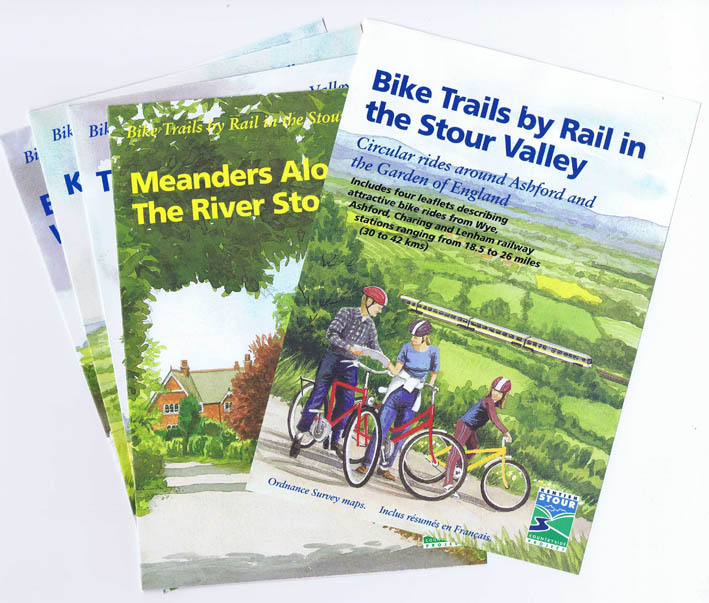 Two new leaflet packs describing easy to follow, circular routes around the beautiful Stour Valley. Each pack contains four full colour, illustrated leaflets with ordnance survey maps and lots of information about what to see on the way. Trails range in length from 10 to 26 miles. Rides from Wye, Ashford, Charing and Lenham railway stations. Areas covered include: Wye Downs, Petham, Hastingleigh, Hatch Park, Brabourne Lees, Hothfield Common, Pluckley and Aldington. Rides from Bekesbourne, Chartham, Sturry and Chilham railway stations. Areas covered include: Bridge, Covert Wood, King’s Wood, Selling, Denge Wood, Waltham, Stodmarsh, Chislet Marshes and Reculver. Each leaflet contains directions and a map. Price: £1.50 each (includes postage and packing).